Although located in the Strand, one of the iconic streets in central London and reference point for those roaming around LSE, the big gate is the old location for the now de-activated Aldwych Station, which was part of the Piccadilly line until 1994. The story of the old Aldwych Station started in 1907. According to Wikipedia, which is definitely a credible source for a post of this relevance, the station was never very popular and, although there were several plans to make it more connected to other branches, these never came to life. During both World Wars, it was used to safeguard artworks and treasures from the British Museum, therefore it is regarded as being key to the survival of all of those important things that you can find in the museum today. 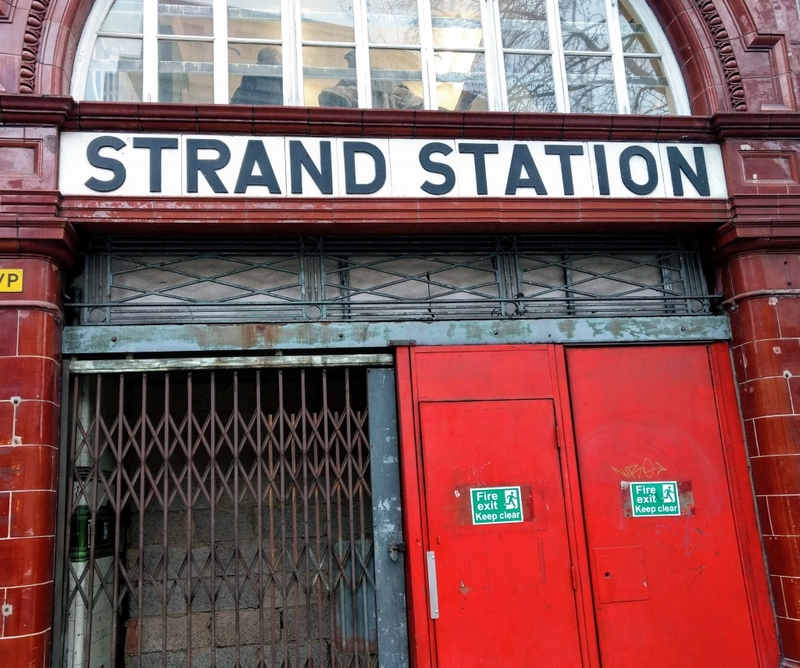 But why is it labeled as “Strand Station” if it holds the entrance to Aldwych Station? Because when it was first launched the station was named differently but since they had already placed the big sign with the old name, someone decided to leave it there instead of replacing it with a new one. Even when it was still active the platform was already used as a location for movies and television productions – and since its de-activation, this seems to have been its major role. Curiously enough, two of my favorite TV series used Aldwych Station for shooting: Mr. Selfridge and Sherlock. These shows have two very important characteristics in common; 1. They are both set in London and make splendid and relevant representations of the city. I would recommend them to anyone planning a visit to it anytime soon. 2. To be honest, the final seasons of each of them are really quite bad. All the little things in this station scream history, it is a very interesting case study for someone researching urban infrastructures, that is for sure; from the big sign pointing to the wrong name, to the mystery of why exactly did they plan on extending the Piccadilly line until the Aldwych. You can read all about it here. The Aldwych Station is regarded as a Grade II listed building, meaning that it is considered of important historic contribution and has to be preserved at least to some extent. Today, this might seem only like an old abandoned tube station, a remnant of an old project, but it is actually a portrait of the city right there before our eyes. A token of London’s urban development history. That little point is connected to everything else through its tubes, but it remains shut by stones and sealed gates. It is like a portal to an underground dimension that remains closed. And it will probably continue to be there without use and outlive us all. If you wish to see this beauty with your own eyes, you can always look around the Strand on a lunch break. You might notice that I didn’t give you the exact address so have fun looking for it. Apparently, you can also take a tour of the old Aldwych Station, although it is quite expensive. Seriously! I am Shocked to know about it…….. I Must say the world is mysterious ever…………….